What is the approximate area of ground you wish to cover with the awning? Measure the width along the wall of your house and the length outwards from your house. 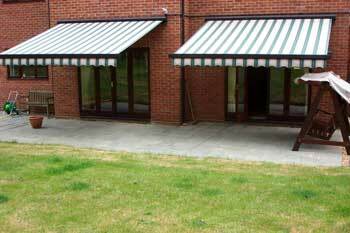 Powered (or motorised) awnings make a great addition to your patio or garden, whatever time of year. If you regularly entertain guests or just want to make the most of your outside space, powered awnings can help you to enjoy your garden to the full. Not only are they practical and durable, but they fold away quickly and easily whenever they’re not in use. The main advantage of having a powered awning is that you can enjoy your garden or outdoor space all year round; even in the autumn and winter – with the addition of lights or outdoor heaters – you can create a cosy outside area while still being protected from the elements. Of course, in the summer you can use awnings to provide well needed shade while still benefitting from the raised temperatures. In this way, awnings are all about protection; cover from light rain or protection from harmful UV rays during those sunny summertime barbeques. A single awning can extend out to over three and a half metres, and offer shade of seven metres across, so they’re sure to be able to cover all of your guests. It’s not just people you’ll be protecting with your awning – outdoor furniture and garden ornaments will also benefit from being covered during the sunniest times of the year, with fabrics less likely to fade and colours being able to remain bright for much longer than normal. Above all else, awnings give you the opportunity to sit back and relax, especially when it comes to powered or motorised awnings – all you’ll need to do is press a button or use a remote control and your awnings will extend in seconds. This means no more fiddling about with umbrellas or retrieving the gazebo out of the shed; your awning will be ready and waiting for you each time, and as they are carefully stowed when not in use, they won’t suffer from mould, mildew or frost. If you view your garden in much the same way as you view your home, then you’ll be glad to know that our awnings come in a wide variety of colours to suit any environment and to complement any existing outdoor design or landscaping; you could even get your awning to match your outdoor furniture. 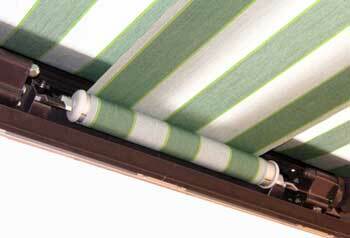 They also come in a ‘lateral arm’ style, so you don’t have to put up with vertical poles or other obstructions in order to use the awnings, and they’re very simple to install and operate, with no tricky instructions to master or extra equipment to buy. So, if you like the idea of entertaining outdoors but are usually put off by the weather (both good and bad), consider a powered awning as a way of enhancing both your home and your lifestyle. Unlike building a conservatory or adding an extension, it involves no planning, no building work, and it can be installed quickly and easily, allowing you more time to relax and entertain friends and family.